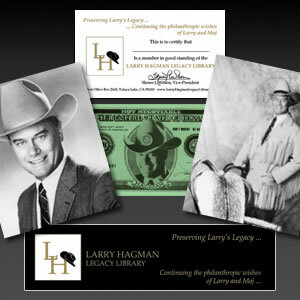 Support the Larry Hagman Legacy Library by becoming a member. Membership benfits include a membership card, bookmark, Larry buck, two BW photos of Larry, 15% discount on gift shop purchases and pre-sale ticket opportunities to library events. Additionally, online access to a members only section of the library website that will feature new memorabilia posted monthly - including scripts, magazines, video clips and other special features from the Larry Hagman Estate.